I’ve been invited by my friend and fellow painter, Katherine Knight to participate in a show she is curating at The Cafritz Fountation Arts Center at Montgomery College outside of D.C. The show is called BC/AC: Art Before After Child and its focus is on how becoming a parent has impacted the artists’ work. The focus isn’t necessarily on how subject matter has changed, but on how our studio practice has been impacted. I was delighted to be asked. Katherine is a painter and a person that I greatly admire. Katherine’s son is about six months older than my son. When I became pregnant I went immediately to her facebook profile to try to glean how she was navigating (or not) her painting studio as a pregnant woman. What I saw was heartening- a photo of a brand new painting! And Katherine with a big round belly. That meant so much to me, because before that, I knew of no other painter/moms who had continued their practice, or who hadn’t switched to watercolors or some other medium. And before that, my mind was filled with worry from the inevitable (and often male) voice on every online art forum that says that women who are pregnant should NOT paint. So, I cleaned up my studio and I continued to paint. Thanks in no small part to Katherine. So, how has my practice changed since having a child? So much in my life has changed since becoming pregnant with Sinclair. We relocated right at the same time that I found out I was expecting. I changed cities, studios, and ways of working all at once. I think one of the biggest challenges for me as a pregnant oil painter– and then one who had my son in the studio occasionally–was figuring out how to paint without solvents. 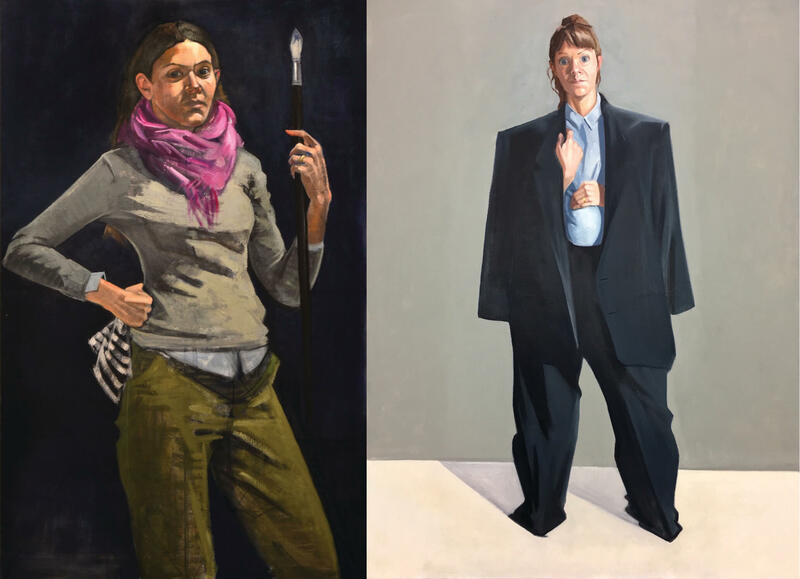 I chose two pieces for this exhibition (both full-length portraits) that I think demonstrate that change. One is a portrait before child, painted in a style that had started to feel like my own- built up in turpentine washes and finished with impasto brush and palette knife strokes. The second was done while pregnant using no turpentine, only a bit of spike oil of lavender. The painting is about the realization of the awesome weight of responsibility of having a child- but in hindsight it also recorded the trepidation I felt proceeding with my oil painting practice. 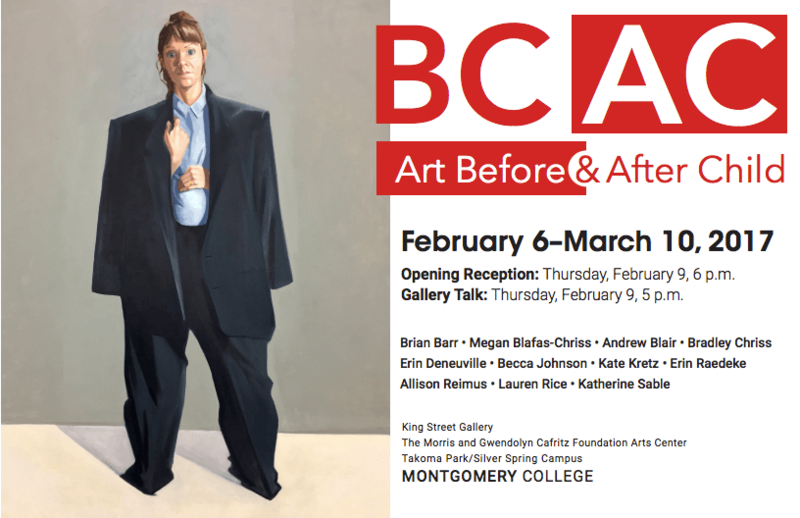 BC/AC: Art Before & After Child will be on display at Montgomery College from Feb. 6- March 10. Check it out if you are in the D.C. area (or more specifically Silver Springs, MD). There will be a panel discussion with some of the artists on Feb. 9th and a booklet to accompany the exhibition. Other artists include Brian Barr, Megan Blafas-Chriss, Andrew Blair, Bradley Chriss, Becca Johnson, Kate Kretz, Erin Raedeke, Allison Reimus, Lauren Rice, and Katherine Sable.